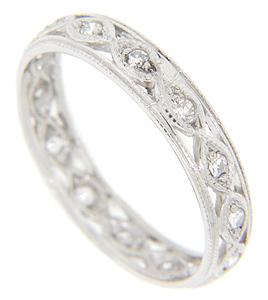 Diamond studded marquis shapes wrap around the entire circumference of this platinum antique style wedding band. The ring has millgrain edges that complement the central design. The wedding ring measures 4mm in width. Size: 9 1/4. Cannot be resized.